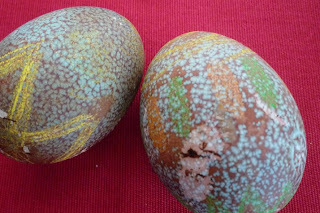 These eggs were quite a surprise, we started off with boiled eggs and scribbled on them with wax crayon. Then we left them to soak in 'Golly' which is basically the same as Kool Aid. It was grape flavour and purple in colour. We left them over night and took them out, left them to dry and they became speckled, much prettier in real life. I really like these. We might try it.